Are you all cracked up because of a recent breakup or fight with your boyfriend or girlfriend? Is your boss driving you nuts? 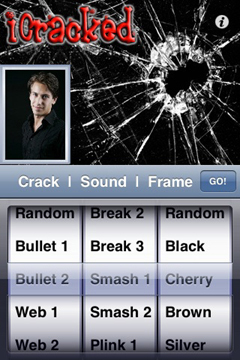 iCracked lets you relieve stress by placing a photo of who ever you want and then smash the photo over and over again. You can choose different sounds, crack types as well as the frame surrounding your photo. Determine your GSM based Treo's approximate location so you can use Google Maps application more effectively. Automatically keep your friends and family informed of your current location. Create location tags and have your Palm based Treo / Centro automatically send your location and photo every few minutes to a varity of RSS feeds.